Whispering Oaks Cottage: FRONT PORCH PARTY!!! In honor of Rhondi's front porch party she is hosting today, here is a picture of, um, well, my patio...my front porch is about a 3 x 5 entryway that does not allow for much more than a potted plant, so I decided my patio will have to do! Go join her at her blog and have some fun! Love this patio, how cozy!!! :) xo! Hi Holly, Wow your patio is cozy ahd inviting. I love it. What a great space to relax in. Thank you for sharing. Stop over to my party, I would love to have you! I LOVE your beautiful patio! I can see some wonderful gatherings in that cozy spot! I LOVE your patio! It is so cozy and inviting! I would love to sit there in the summer! Thank you so much for stopping by my blog! Beautiful Patio Holly! Just lovely. I wanna come have lemonade with you! I want to come and sit on your patio, it looks very attractive, and so comfortable. Thank you for visiting me in France! 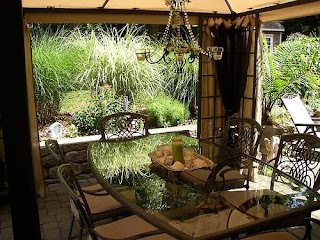 I love your patio (and especially that chandelier!). You have a really cute blog too - I think I need to do some reading this weekend here and see what it's all about. Love your style and the sites that are your favs too! Beautiful patio. It looks like a wonderful place to spend some time. The chandelier is awesome. Thanks for visiting me! You have a beautiful patio! Love the gazebo! Very pretty! Thanks for sharing and feel free to stop by my porch! Ruth what a fabulous place to sit and chat. Your patio looks so cool and relaxing. And, that chandelier is gorgeous. Such a lovely space to eat, read, relax - thanks for sharing. Hi Holly, love the patio. Like your blog too. Thanks for having me. Thanks for joining the party. Your patio is wonderful and I can imagine lots of great conversation and food around the table. Hi Ruth.... your back porch/patio is lovely. Love it here, Holly! Looks so cozy! Found my way here from the porch party, a few days late, lol. I saw this on RMS! Love it then and love it now! Wonderful job and the chandelier is perfect! What a wonderful patio! Love the candelier....I could just see sitting there for dinner under the candlelight..
Hi Ruth! looks like a lovely place for a party! Your place is lovely! Love the patio. Love the blog. I love when people put pictures of their homes and garden areas. That way I can copy cat others idea's and pretend they are my own. Muahahahahahaha !!!!!! So post more and keep up the good work. ahhhh, this is just a beautiful spot, dear Holly! It looks so inviting...just like the rest of your beautiful home. WOW, that's really pretty. Love the chandelier & the canopy...love it all!